In his latest book – Composition Digital Field Guide – author and San Diego-based photographer, Alan Hess, shares his knowledge of photo basics for the frustrated novice wanting a better image. Covering a tremendous array of topics, Alan breaks down the basics of composition, explaining the rule of thirds, use of color and cropping, even tips on achieving better exposures and color balance. For those of you feeling a bit overwhelmed by the world of digital photography, this field guide will not only help you understand the basic functions of your SLR in order to get better shots, but also help you get a bit more creative in order to achieve dynamic and striking compositions. Alan conveys the importance of thoughtfully considering your subjects and environment while executing specific techniques in order to get those shots you've always wanted but couldn't seem to capture. With chapters including Symmetry and Balance, Light and Exposure, and How to Use the Gray Card and Color Checker (cards included in the book), Composition Digital Field Guide is – surprise – about much more than composition. It's a great read and camera bag accessory for anyone looking for a some handy tips and information. 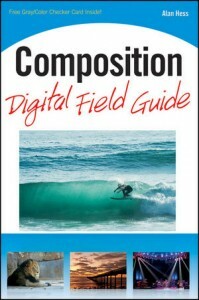 WIN a copy of Composition Digital Field Guide – signed by the author! Artistic Photo Canvas – Alan Hess' preferred lab for lifelike prints on canvas – has four signed copies of Composition Digital Field Guide to give away to readers of The Photo Canvas Blog! For your chance to win, just post a comment below. 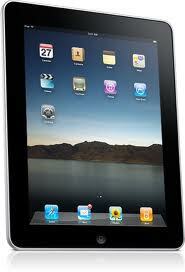 We'll draw one random winner each day between Wednesday, Oct. 27 and Saturday, Oct. 30, 2010. Be sure to use a valid email address when posting your comment – it won't appear on the blog – so we can contact you if you're a winner! Good luck! Wednesday, October 27: Michael Kells – Congratulations! Thursday, October 28: Angie K – Congratulations! Friday, October 29: John Tammaro – Congratulations! Saturday, October 30 – Don McGurrin – Congratulations! Some of the most stunning photos printed on canvas by APC are shot within our national parks. And our customers tell us that one of the easiest ways to find and capture the iconic scenes that make each park so special is to simply follow the advice of photographers who've toiled for years scouting the perfect locations. Thousands of photographers have contributed to the printed books and shooting manuals that for decades have served so well as guides for pros and amateurs who want to follow their leads into the wilds of the park system. Now, however, a new breed of photographers is creating robust electronic guides that carry the promise of lightening our loads during the hunt for the perfect shot. The creators of the iFotoGuides for iPhone and iPad have already introduced three park-specific apps that are fulfilling that promise – with more in development. Now, shooters trekking to Arhes, Yosemite and Grand Canyon National Parks can arm themselves with a few megs of data on a device they already carry, swapping out the weighty printed materials for an extra camera body or lens – or the extra provisions that will enable them to venture further than their encumbered fellow shooters. Each app includes vital park information, interactive maps, photo locations, sunrise and sunset tables, stunning image galleries by renowned expert photographers, and even information on dining, lodging and other nearby services – in short, all of the information you need to make the most of your photo tour of each park. These guides won't weigh you down by one ounce, and the iFotoGuide apps set you back only $4.99 each – way less than those heavy printed guidebooks. After a weekend of image evaluating and score tabulating by a panel of HDR experts and enthusiasts, we're excited to announce the winners of our first HDR Walkshop Photo Contest! The APC HDR Walkshop with Brian Matiash at Photoshop World Las Vegas, held earlier this month, was universally praised as a good time and a great learning experience. 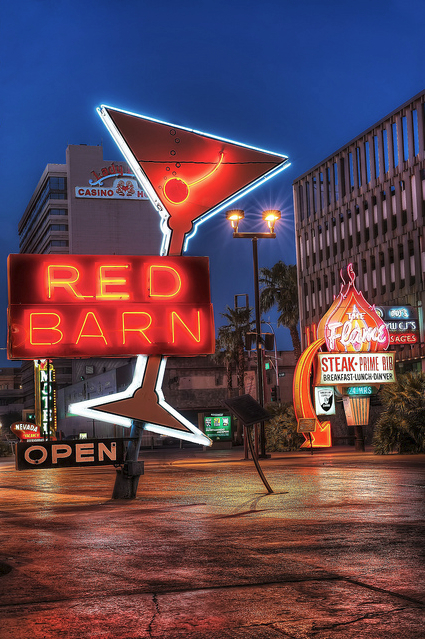 About 30 walkers joined Brian, co-leader Jacob Lucas, and the crew from Artistic Photo Canvas for a walking photo workshop in Old Las Vegas focused on high dynamic range photography. Fremont Street Experience – a flashy, neon-lit entertainment district oozing with character and texture – is the destination for millions of tourists and locals. It was the perfect locale for capturing brackets, which our walkers post-processed into a fantastic batch of HDR goodness that's now on display in this colorful, full-size slideshow version of the APC HDR Walkshop Photo Contest group pool on Flickr – where you can see and enjoy all of the entries. Many entries represented walkers' first foray into HDR bracketing and post-processing. We were roundly impressed with the quality of the entry pool overall, and especially the efforts and results of the participants for whom, less than a month ago, HDR was but a tantalizing concept. Choosing winners was a truly difficult task. Every judge – including Brian, Jacob, RC Concepcion (Educator and curriculum developer for NAPP, co-host of Layers TV, writer for Photoshop User Magazine & Layers Magazine, and HDR expert) and Lew Bedell and Bob Melson (co-founders of APC, sponsor of the HDR Walkshop) – brought their own judging criteria to the table – with opinions as diverse as the body of work that is classified as HDR. The winning images represent the convergences of those varied tastes and sensibilities. Toni's image showcases a nice balance of HDR processing. It's strong without being over-the-top, bringing out all of the rich textures of the scene. The composition is very appealing in its skewed angle and the way that it only shows a portion of the Fremont Street 'Las Vegas' sign. 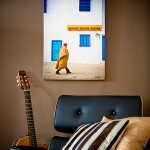 Toni will receive a Custom 32" x 48" Gallery Wrapped Canvas featuring her winning image courtesy of Artistic Photo Canvas. William did a really nice job of capturing the full dynamic range of the scene. He recovered most of the detail that would normally have been blown out in the neon and lit signs. The textures brought out of the pavement were also fantastic. William will receive a Custom 24" x 36" Gallery Wrapped Canvas featuring his winning image courtesy of Artistic Photo Canvas. 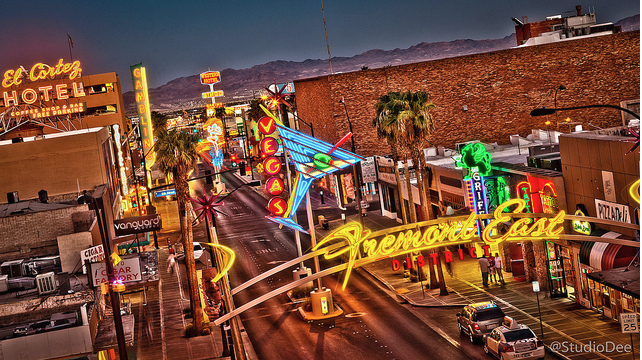 Damien had a very strong composition, showcasing the Fremont Street Experience front and center. He did a great job of leading the eye through the frame and supported it with some great HDR processing. Damien will receive a Custom 12" x 18" Gallery Wrapped Canvas featuring his winning image courtesy of Artistic Photo Canvas. Dave presented a nice juxtaposition of urban structures interwoven with the natural elements of palm trees and shrubbery. His HDR processing was clean and subtle. David also operated with a significant handicap due to the limitations of his camera, but worked through them quite admirably to get the brackets that he needed for tone-mapping. 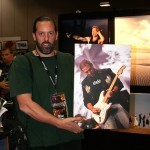 Dave will receive a Custom 12" x 18" Gallery Wrapped Canvas featuring his winning image courtesy of Artistic Photo Canvas. Congratulations contest winners! 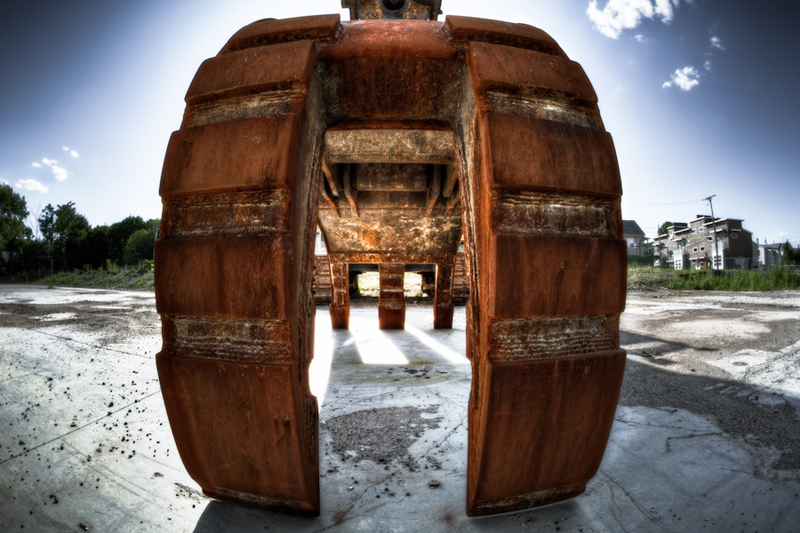 We can't wait to see these great HDR images printed on canvas! 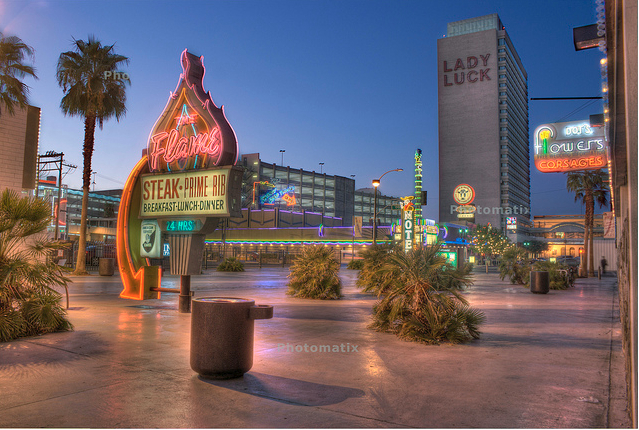 We hope every registered participant of the APC HDR Walkshop at Photoshop World Las Vegas feels like a winner too. We all enjoyed the interactive, expert HDR instruction, the camaraderie, the after-party. 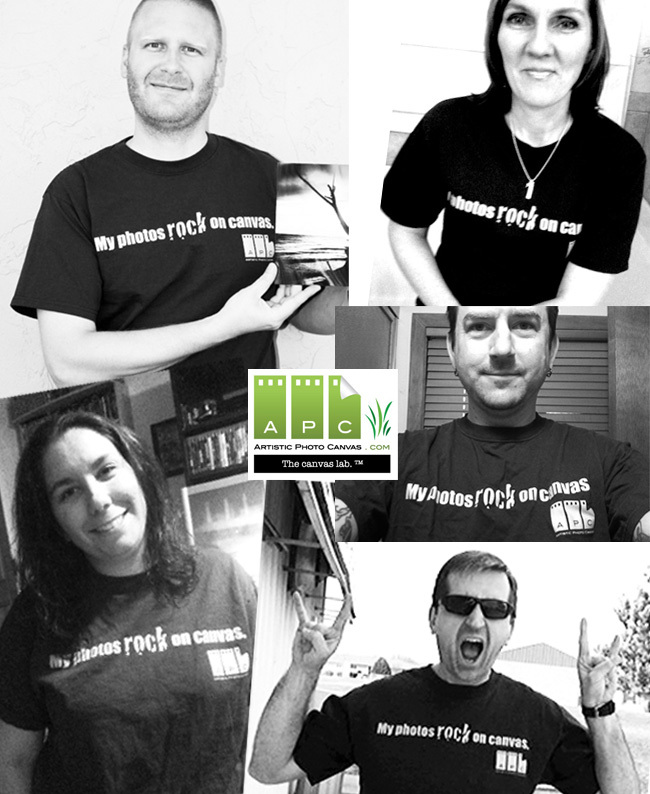 And every walker scored an APC "My photos ROCK on canvas" t-shirt and an APC gift card. We hope those cards will be put to use bringing many more of the HDR images entered in the contest to life on canvas. We welcome your comments below – and we're sure the contest participants will also appreciate and enjoy reading any comments and kudos you care to share with them on Flickr. 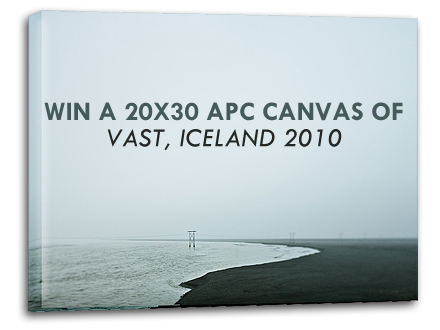 Today (Sunday, September 12, 2010) is the last day to be entered into renowned world and humanitarian photographer David duChemin's drawing to win a 20" x 30" gallery wrapped canvas print of "Vast" – one of the remarkable images captured during his recent trek to Iceland. 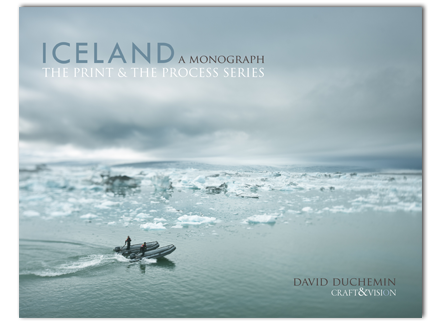 Your chance to win is a bonus with the purchase of David's latest eBook "Iceland: A Monograph." An awe-inspiring and enlightening 65-page exploration of images and techniques, "Iceland: A Monograph" is part of duChemin's The Print & The Process Series, designed "to discuss the process of creation in a way that pulls the curtain back on techniques." To read more about "Iceland: A Monograph," as well as purchase the eBook for just $4.00 (20% discount from the regular price of $5.00 also expires today) – and receive an automatic entry into the drawing for his breathtaking print of "Vast" – please visit this link at David duChemin's website. On the heels of Photoshop World Las Vegas and our successful first-ever conference event – APC's HDR Walkshop with Brian Matiash – the timing couldn't be better to share with you the final chapter in Brian's phenomenal HDR Best Practices Guide. 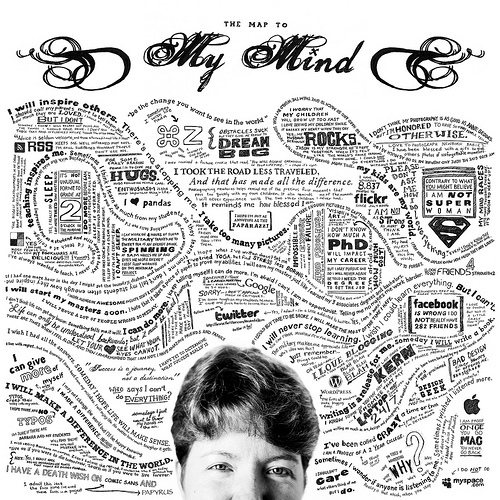 Get ready to learn from a master… and enjoy! We’ve had quite the journey thus far. By now, you have rocked it out in the field and captured some fantastic brackets. You’ve also nailed down your image management process, ensuring that you know exactly which images you will be tone-mapping. This leaves us with our final phase. The last stop. I admit it's bold to say that every digital image you take will see some sort of technical refinement but it’s the truth. Barring strict photojournalistic ethics, just about every image you share, in one way or another, will be refined to taste. The term most commonly used to describe this refining phase is called ‘Post Processing’. It’s also typically referred to simply as ‘Post’, as will be the case for the rest of this Guide. The craftsmanship of your final results rests squarely on your ability to utilize and navigate through the tools that you have at your disposal. In most cases, people usually make core adjustments to an image: the exposure level, contrast, and saturation. HDR imaging brings it to a whole new level because before you can even start adjusting any of those values, you first have to derive your tone-mapped image. If you think about it, your brackets are the paint on your easel. The quality of these brackets will directly affect the color and quality of what you can paint with. Hopefully, the first two parts of this Best Practices Guide have helped ensure you get the best possible brackets. An optimal series of brackets will contain detail ranging from the highlight areas (typically found in the darkest bracket images) through the mid-tones (the normal exposures) and onto the shadows (the brightest bracket images). Reviewing these brackets while still in the field is integral to ensure that you get the correct details in all of your exposures before leaving the scene. You’ve seen me use the term ‘tone-mapping’ here and you’ve likely read it on other websites. For the sake of thoroughness, let me quickly and loosely define the term as it is a critical step in the HDR process. In actuality, just about every LCD and printer that you are currently using cannot accurately display all of the data in an HDR image. There is simply too much information in the highlight and shadow areas for your screen to output. To mitigate that limitation, algorithms have been created to ‘tone-map’ the HDR image into a range that your screen and printer can handle. This process of scaling the HDR image down is done at a pixel-by-pixel level and, as a result, you really want to make sure that the pixels found in all of your brackets contain enough exposure detail so that the entire scene is represented accurately. 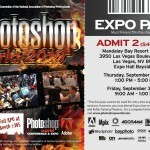 It doesn't get any better than this… The world's biggest convention devoted to all things Photoshop at one of the world's most exciting resorts – Mandalay Bay on the Las Vegas Strip. 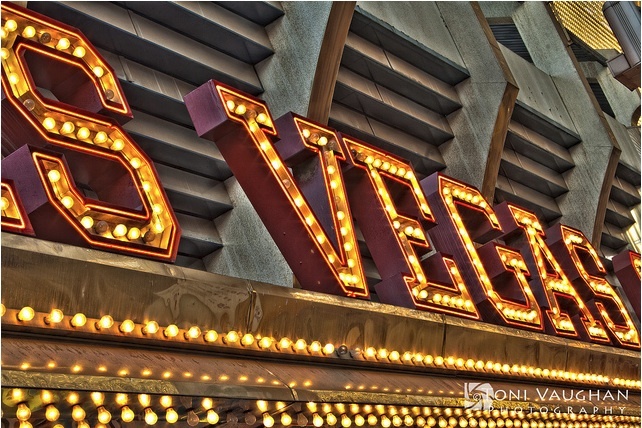 Between August 31 and September 3, 2010, there’ll be more than 100 classes and seminars lead by 35 amazing instructors – plus hands-on photo field trips, a big technology expo, cool parties and, of course, all the fun and madness that is Las Vegas. Artistic Photo Canvas will be doing PSW in style – this time setting up shop right inside the doors to the Tech Expo at Booth 305. Not only is our booth a traveling gallery for the amazing work of celebrity, pro and amateur photographers displayed on about 40 gorgeous canvases – it’s also a focal point for lots of fun, and some great prizes too. In fact, we’ve got so much going on this year, we’ve penned this handy guide so you don’t miss out on any of the APC action! Can’t make it to Photoshop World this year? …Keep reading! You can still win some great APC prizes via Twitter and Facebook during the event! APC’s Show Special is so good we can’t even talk about it in a public forum. Suffice to say the APC Show Special will be the single best deal on the floor of the Tech Expo – and if you miss out on it, you’ll be kicking yourself later. Registration was full in less than 24 hours, but check out this previous post to learn about the good times High Dynamic Range photography enthusiasts will be having in Old Las Vegas during APC’s signature event on Wednesday, September 1 with HDR master Brian Matiash and his gifted bracket shooting mate, Jacob Lucas. If you’ve missed out on this one, don’t fret! Future Walkshops are already in the works. If you are registered for the Walkshop, don’t be late to the rendezvous point – there’s a waiting list of folks eager to take your spot! And remember, if you bring the APC Prepaid Card you receive on the Walkshop to the APC booth on Thursday or Friday, September 2 or 3 – while wearing your new APC t-shirt – we’ll double the value of your Prepaid Card. If you RSVP for Photoshop World on the Artistic Photo Canvas Facebook page – whether you are attending or not – you’ll be automatically entered into our drawing to win one of two custom 16x20 gallery wraps from APC. The first will be given away to a randomly selected PSW attendee. (Just visit our booth and ask if you are the pre-determined winner.) The second gallery wrap will be given away in a random drawing of all people who RSVP’d – with the winner to be announced on our Facebook page after PSW wraps up. One of APC's favorite customers and evangelists, Christopher Stampar, will be tweeting canvas ideas and tips for the duration of Photoshop World. If you’re the first to retweet a tip, you’ll win one of the very nifty iFotoGuide iPhone apps. iFotoGuide apps are the perfect replacement for those cumbersome travel guides to some of our country's most photogenic national parks. 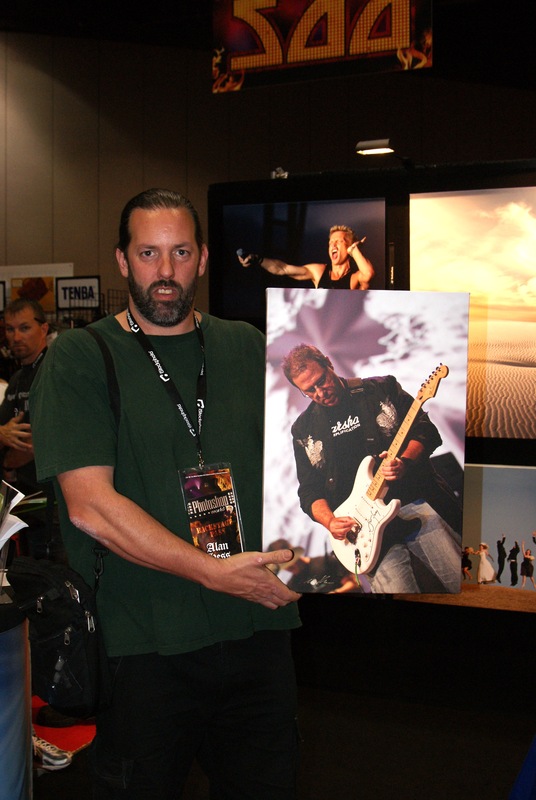 Be sure to follow Christopher Stampar on Twitter for some great advice on canvas printing – and your chance to win! Throughout the conference, you'll also want to keep an eye on the messages appearing in your Official Photoshop World Conference App for iPad and iOS4. You could snag some APC loot by being among the first to visit our booth after an APC prize alert is pushed to your iDevice. (There will be prize alerts for other vendors on the Expo floor, too.) The app author, Shawn Welch, has created an incredibly useful and attractive application that is about so much more than prizes. If you don't already have it downloaded on your iPhone and/or iPad, you need to do it now! APC will also be at the Official PSW Tweetup on Tuesday, August 31 from 7:30-ish ’til ? (on the patio outside the conference registration area). Find Team APC to get a bonus entry in our iPad giveaway by snagging the secret word. 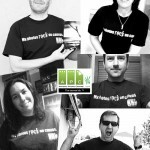 If you’re really lucky, you might also snag a killer, limited-edition PSW-themed “My Photos ROCK…” t-shirt! 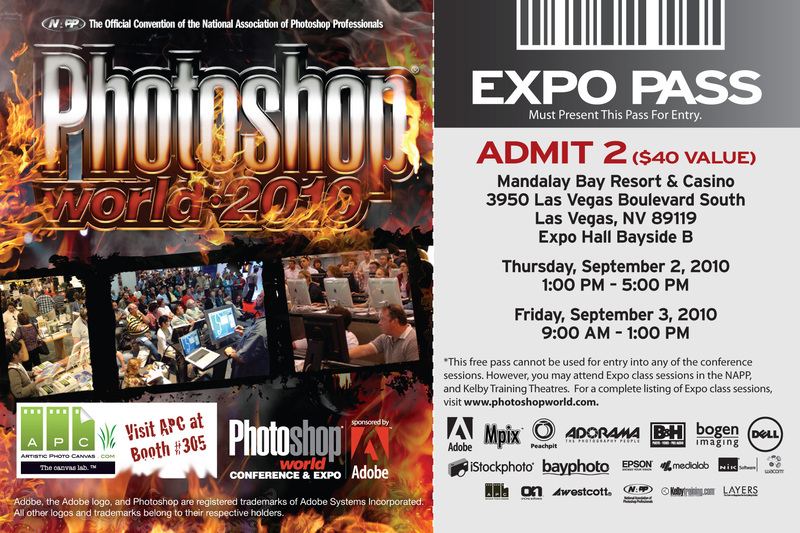 Even if you’re not registered for the Photoshop World Conference in Las Vegas, you can still attend the PSW Tech Expo for a day (or even two) as a guest of APC! Just click on the Expo Pass thumbnail to the left to get to the full-size version. Print the APC Free Expo Pass out and present it at the Expo doors on Thursday, September 2 or Friday, September 3 when the event is open to the public. You’ll score free admission for two – a $40 value. There are dozens of classes and demonstrations taking place on the Expo floor every day – so, in addition to taking in the latest offerings from APC and the many other exhibitors on the floor – you can also take advantage of some great, free training presented by some of the biggest names in photography and Photoshop! Brian Matiash, the leader of APC’s HDR Walkshop in Old Las Vegas, will also be hanging with the APC crew throughout the Tech Expo. Brian will be there to answer your questions and share his insights in an informal setting. If you’ve ever wanted to spend some QT with one of the most respected pros in the world of HDR photography – this is your chance. Swing by, say hello, talk HDR, and discover why Brian’s work is exclusively printed by APC on canvas. For an occasional “heads up” when Brian will be swinging by, follow Brian Matiash on Twitter. World and humanitarian photographer, David duChemin, is a big fan of APC gallery wraps, and we’ll be displaying one of his favorites – the cover photo from his best-selling book, Within The Frame: The Journey of Photographic Vision in our booth throughout the show. Ever generous, David is working with APC to give away the very print you can see and touch on the Expo floor. For your chance to win David’s stunning 20" x 30" gallery wrapped canvas, watch this space for details – coming soon. What better way to wrap up Photoshop World than with another gallery wrap giveaway? PSW attendees that fill out their conference questionnaires will be automatically entered for a chance to win a custom 20x30 gallery wrap from APC. The winner will be drawn during the Closing Ceremonies and announced live from the stage. You must be present to win. 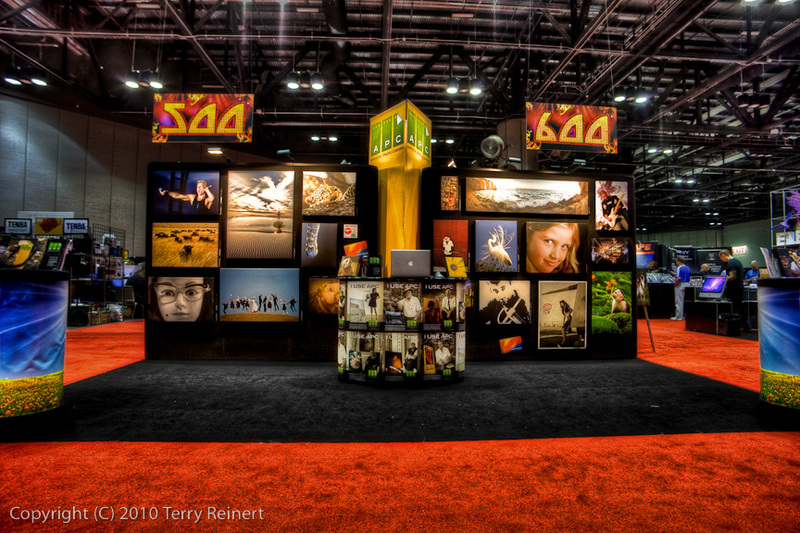 Prizes and promotions aside, the big reason you’ll want to hang with APC at Photoshop World will be to check out the exceptional quality and service that set Artistic Photo Canvas so far apart from all of those digital photo labs that “dabble in canvas.” We’re hanging the work of more amazing photographers including David duChemin, RC Concepcion, Brian Matiash, Scott Bourne, Dave Cross, John Batdorff, and many other gifted APC customers. You’ll definitely be inspired. And if you’ve ever wanted to meet in person some of the friendly APC-ers that you’ve talked to on the phone – Lew, Bob, Melanie, Mike and Camille will all be there. We can’t wait to meet you. Rock on! So, you finished reading HDR Best Practices Guide - Part I: In The Field, and went out for a shoot. You had all of your wits and your gear about you when you set up your tripod and fired off those lovely brackets. You’ve got the raw materials (fine, pun partially intended) and now it’s time to refine them into something truly beautiful. 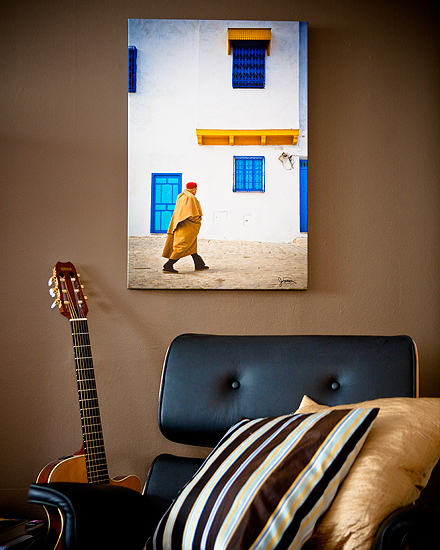 At Artistic Photo Canvas, we love that we’re able to keep our finger on the lively pulse of the photography community. We know that HDR photography is much more than just the “Hot Topic du jour.” We see all of the wonderful detail and tone in the images that our customers share online and – best of all – we get to see, on a regular basis, that HDR images make for some truly amazing looking canvas prints. 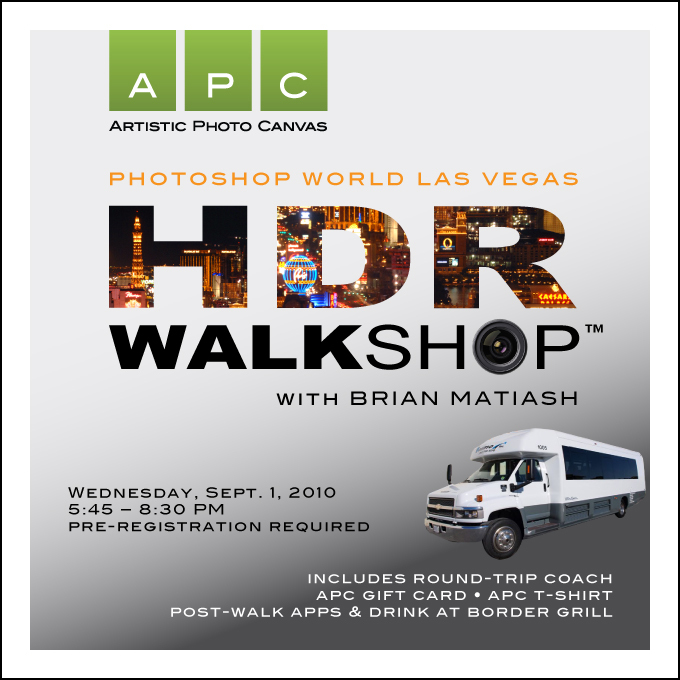 That is why we are excited to announce APC’s very first HDR “Walkshop” … a walking workshop to be led by our good friend and renowned HDR Photographer, Brian Matiash. 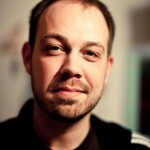 Brian's skills and expertise in the realm of HDR photography are highly regarded – as are his mentoring abilities in sharing the nuanced shooting techniques and post-processing mastery he’s known for. 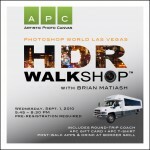 APC’s HDR Walkshop will take place next month during the Photoshop World Conference & Tech Expo in Las Vegas. For those of you that don’t already know, Photoshop World is the world’s largest Photoshop convention. The skills that are learned… the friends that are made… the good times (and the Expo deals) that are had… are legendary. This September will mark APC’s sixth PSW Expo – where we have the great pleasure of meeting in person so many of our amazingly gifted customers. We wanted to organize something special for our friends at the show this time – and we couldn’t be more enthusiastic about sponsoring this event. Working with Brian has been incredible. 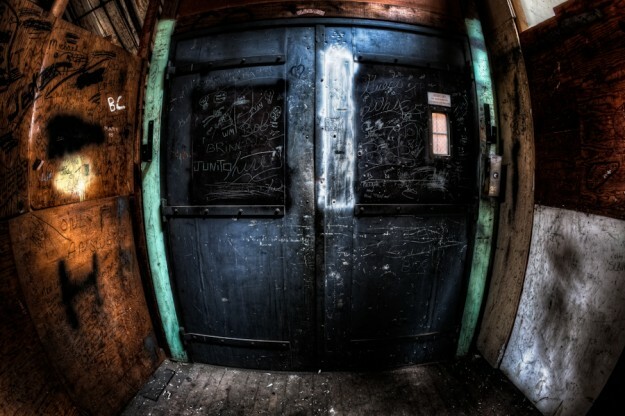 His passion for photography and HDR and teaching are contagious. If you're able to go, we can pretty much guarantee two things: You’re going to learn a lot about HDR photography. And you are going to have a really good time doing it! The official registration page has all of the details about the Walkshop – and the extra goodies we have in store for you. Head on over and check it out for yourself by clicking the banner below. We can’t wait to see you in Vegas. And we can’t wait to see the awesome HDR images that you create! “When I was getting ready to go to New York for the Photoshop CS5 Summit, I wanted to take a couple of days to get some shooting done. Not long after I decided to take the time, my buddy Rick Sammon called and asked if I was interested in taking pictures of the Chuang-yen Monastery in Carmel. Monastery… New York? I’m there! “Rick and I had lunch, and got to walking around the temple. What I originally thought was going to be a hot day of running around all day (I had gotten lost for several hours already – despite being a New Yorker) turned out to be perfect! Shooting in the middle of the day meant that I would be processing most of these images as HDR, but I was totally OK with that. “Sometimes when you go out and shoot, you just import the pictures and you get to revisit them every now and again as you scroll by them. I figured, why wouldn’t I just give it away to anyone who wants it?